[Updated with Q&A video] The PLP has made “sure and steady progress” on transport, and has a number of planned initiatives including attracting cruise ships, expanding airlift and redeveloping the airport, Transport Minister Walter Roban said today [Dec 10]. We will expand air lift from Europe, the Caribbean, The Gulf Corporation Council Region, the Azores and Latin America creating opportunities to bring more tourists to our shores. We will work with the minibuses to provide shuttle services that enhance and compliment public transport. Install cameras on buses to make them safer and implement a fully digital taxi dispatch system. “Transport is vital to our economy, and, what I, and so many others want to know is whether any Transport projects will be on the chopping block for the OBA’s Cuts & Pain Commission,” continued Mr Roban. “In a release last night, the OBA’s Bob Richards noted that their Cuts & Pain Commission was nothing more than an efficiency group that the PLP has already implemented. If there is really no difference, why is Mr. Richards copying our idea and why isn’t he praising us for implementing what he recommends? “Will our buses and ferries be able to be effectively maintained or continue the quality services they give to residents and visitors. Will infrastructure be upgraded with staff be trained under an OBA transport plan? In fact, where is their plan? “It also clear that they have no credible ideas for the future of transport and their proposals would not allow for anything resembling the forward thinking initiatives we have for the airport, ferry service, water front development, technical training , maritime and aviation or entrepreneurship to see the light of day. As Minister of Transport, I am proud of the sure and steady progress we’ve made in making it easier to get to, from and around Bermuda. Think back to 1998 and the state of our transportation system. Bermuda’s buses and ferries were older, less efficient and less comfortable for our passengers. Parents had to pay for their children to ride the bus and licensing your vehicle was a time consuming and painful ordeal. The cost of flying to and from Bermuda was significantly higher and we had a fewer range of airlines travelling to and from our shores. There was no National Transportation Plan. Since that time we have made significant, steady progress in our transport infrastructure, with new buses, fast ferries and a wider range of transportation options. Today, fast ferries carry commuters and visitors to different parts of the island quickly and safely, all while intersecting with our buses. Residents now enjoy wider transportation options and our taxi industry is undergoing steady modernization. There is a great spirit of cooperation with the Taxi Commission as they work to address the issues important to operators and dispatch companies. There is even the prospect of a modern universal dispatch service owned and operated by stakeholders in the industry. The transportation transformation has not long been just on our shores. Bermuda has ventured into the arena of international aircraft registration, creating a thriving and growing register that has become an important revenue earner for our country. When it comes international maritime industry Bermuda’s Red Ensign designation remains in the top tier of Shipping registry with increased tonnage and ships from the world’s most prestigious companies listed on the registry. L.F. Wade International Airport remains our window to the world, with new low cost carriers such as Air Tran and West Jet helping to reduce the cost of travelling to Bermuda. We created the new Heritage Wharf which has brought in over 100 million dollars in revenue, meeting our expectations and earning revenue well beyond what we paid for it. TCD has been modernized making the tedious and painful process of licensing your vehicle easier and far less time consuming. The evidence is clear, since 1998 , The PLP has made sure and steady progress on transport. Transport is vital to our economy, and, what I, and so many others want to know is whether any Transport projects will be on the chopping block for the OBA’s Cuts & Pain Commission. In a release last night, the OBA’s Bob Richards noted that their Cuts & Pain Commission was nothing more than an efficiency group that the PLP has already implemented. If there is really no difference, why is Mr. Richards copying our idea and why isn’t he praising us for implementing what he recommends? The fact of the matter is that in order for the OBA to fulfill their promises to the Bermudian people, they are going to have to engage in deep and radical cuts. You can’t increase spending and cut taxes to the tune of $500 million and also expect to reduce the debt without engaging in deep and radical cuts. So, in light of these facts, the question is, what will the OBA’s Cuts & Pain Commission have on its chopping block? Will they cut salaries? Will they cut benefits? Will they cut public education? DayCare? FutureCare? The EEZ? It’s time for Bob Richards and the OBA to tell us their secret spending cut plans. Will our buses and ferries be able to be effectively maintained or continue the quality services they give to residents and visitors. Will infrastructure be upgraded with staff be trained under an OBA transport plan? In fact, where is their plan? It also clear that they have no credible ideas for the future of transport and their proposals would not allow for anything resembling the forward thinking initiatives we have for the airport, ferry service, water front development, technical training , maritime and aviation or entrepreneurship to see the light of day. Bermuda would see no progress in the transport industry under the opposition’s cuts and austerity which will hamper our development. The PLP has a clear vision for where we want to take transportation in Bermuda and the platform makes this crystal clear. All of our initiatives prove we are Standing Strong with Bermudians and making sure our investment and work in transport serves to expand opportunity and improve the quality of life for all our residents. Please give us the specific part of the OBA platform, candidate speech, flyer, commercial or anything else that states these cuts are taking place. With respect to clear eveidence of improvement – please provide this. With repsect to upkeep on public transport vehicles – well….how many buses are off the road? 8 year olds could make up better stories. Roban, the man who on his last day in a ministerial role, slyly pushed through friends and family PLP planning applications !! The OBA do not have a cuts and pain, THE PLP ARE THE AUSTERITY PARTY. They cut services on the ferries and doubled the cist of fares for some routes. They cut the proper maintenance of the buses. A crazy amount are out of service.Marc Bean claimed the The fast ferries were near the end of their working life. Burgess went and ordered 2000 tyres, to go with his LED lights. Now they can get cruise ships for dockyard and Hamilton….why haven’t they been doing this in the last year? Airport, we have an airport! Lets focus on the deadly condition of the roads, the rubbish uneven trench filling around the island, the faded white and yellow road markings everywhere. There it is…investigate the options for evo friendly buses…not going to happen, they just threw this one on the list. The cost of flying to and from Bermuda was not more expensive 1998 either!!! The tax on flights is brutal! In case you forgot…THE PLP = Austerity, job cuts, less services, more promises with no results…..
Heritage Wharf has not made a profit…all the overheads in the tourism dept, the maintnance, and incentives given to the cruise ship comanies plus the cost of building it are far in excess of 100million. Who are they trying to fool! When calculating they forgot to deduct the increased wear and tear on our roads, our busses anf fast ferries and the increased pollution as the tourists are stranded in Dockyard otherwise. PLP put everything though Wedco, because the have comtrol over the Wedco purse. Guess he forgot to mention the fact that the dock was broken withn one year and that it went over budget by more than $25 million amongst suspicous circumstances (re: Correia emails revealed by the RG a few years back). Guess he also forgot to mention that the $60 million dock now needs to be modified already after less than 3 years in operation. Forgot to mention that this project when $10 million over the budget with the contractor (Correia) being paid to build his own business. He is (part) owner of teh Emmissions company that runs teh TCD testign area. Looking like they have been to war and back with only one or two actually ever working at one point in time. While the old UBP ferries are stil being used for several routes and in the event that the fast ferries break down. When was the shipping registry created? Interesting answer, if it ever gets answered. Why doesn’t he mention the constant transportation issues for our tourists who disembark in Dockyard over the last two summers? More of the same lies and spin, just as laid out in Michael Markham’s Electoral Strategy report. “Cuts and Pain Commission”, “spending and taxes totalling $500 million”. Both fabrications of the PLP. Make up a lie and keep saying it. They must be getting worried now in the last week before the election. Instead of the “we plan to” they have now used “we will”. After 14 years it’s a bit late. PLP are once again telling lies about the OBA…..they are desperate, very desperate, as they know that the voting public have seenthrough their pathetic platform, failed promises and admissions of planning many more cuts to services. The public are on to their evil divisive strategy, but we all know that Bermuda must all work together to get us out of this mess. Something the PLP do not want, they want to do…it is their dictatorial way or nothing. Do you want to be told how to live your life !!! Really? When was the last time the bus schedule was changed? How can you get efficient, quality service with a schedule that was designed sometime between then the dinosaurs went extinct and King Arther ruled medieval Europe? Last time I checked Bermuda had built a MASSIVE pier to accomodate HUGE cruise ships that weren’t around when the schedule was drawn up. Hey Roban – it’s not the Gulf Corporation Council, it’s the Gulf Cooperation Council. But then this Gover(n)ment has always had trouble in that department hasn’t it? They can’t run a bus service properly. The bus terminal is chaos every single night. They have changed the schedule, without announcing anything. I guess there isn’t enough money to run a proper service any more. The Transport Minister doesn’t care, of course, he has his air-conditioned GP car to swan around in. There has been significant transportation improvements under PLP. signinficant upgrade of teh bus fleet – most are now 2k (year 2000) or newer. We forget the older buses? Dockyard Pier – where would we be without the mega ships? I offer my best wishes to the Minister as he seeks to find a new ship for St. George’s and Hamilton. You cannot blame the government for poor usage?! Why introduce something that nobody is going to use? Let’s say government introduces a brand new, for the people, elephant grooming station on front street. Or a Llama racing track at Southside. Would you applaud them when nobody uses it? And the mega bill for a pier that’s already crumbling apart. Well, the Salvation Army might not be appealing for assistance to feed 1400 families this Christmas. A few kids might still have a bed at the Sunshine Home. The Mirrors program might still be running…. Vote For Me, you obviously never use buses. They are horrible. If you believe the bus service has been upgraded you should try going to the bus terminal at 5.15pm. Its chaos. The buses are shite. Try catching one in August. The a/c never works. The drivers are permanently in a bad mood. The ‘new’ buses have fewer seats and are not practical. I know Ewart boasted about how they are wheelchair accessible, but as we all know, that does mean anything. No-one in a wheelchair can actually get on the bus because kerbs aren’t compatible. By the way, last year the Fast Ferries had their speeds limited to save fuel, because the PLP can’t afford to run them. Funniest part is when you take it during after-school hours and the bus driver stops the bus for 15 mins just to tell some kids in the back row to shut up. The fast ferries are a good service but their scheduling is a joke. Grasping at straws to get a line in. oh yes you have done so much for transport except for the wildcat strikes, days off to look at a schedule…ferry that does not run….cruise ships leaving..cruise terminal falling apart……and now you want to increase air lift to Gulf States, Caribbean and other places that will attract no one….Gulf States? will the increase in visitors from those regions stream into Bermuda like the Indian and Chinese did when Ewart and Company visited? How is that Indian movie studio coming along? 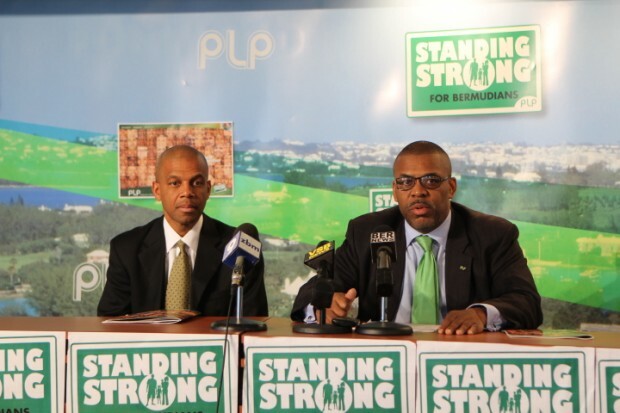 everything that comes out or your mouths are lies and dreams that no one believes anymore but I expect we will see all of the drones coming out this week with press conferences…..god I hope they go away…..
PLP’s 2007 platform included: Free bus and ferry transportation for all Bermudians. As well as expansion of the ferry service… Since then there has been a significant reduction in the ferry service and we are still to see the FREE RIDE… Nothing but LIES!!!!! The ferry service has been poorly managed and maintenance is a joke. Walter Roban should have taken responsibility for his poor management and resigned months ago!!! Not a recent supporter of the PLP , however I must say students (and I believe seniors) get free bus and ferry rides. However, I would prefer to see a reduced fare instead of free. Nothing is ever free, someone always pays! I’m just tired of it being me! But prior to the 2007 election the PLP promised that all public transport would be free for all users. That is a promise that was not kept. They make promises to get elected, and have no intention of keeping them. Has anyone noticed that the PLP have constantly said “we will do this and we will do that”? Why has none of this been done before, as they have been in the drivers seat for the past 14 years? Is 14 years not long enough to effect change? From what I see they have only been able to raise their salaries! That is why they are the ‘Gonna Gubberment’. All we hear from them is Gonna do this or Gonna do that. All they do is talk. Talk talk talk. Vote PLP on the 17th December 2012. Screw the people with an erection that lasts 14 years……. (well if your a morning dove). How can you tell when a (PLP) politician is lying, stretching the truth, repeating previously unfulfilled platform strategies or making hollow election promises? PLP – Betraying Bermudians since 1998; one unemployed voter, decreased bed count, falling occupancy levels, vindictive policy making and blame for everything on everyone else but themselves. Voters deserve better. Voters deserve change. Vote OBA. Mr. Roban, you crack me up bie. I find public speaking as challenging as the next person, but seriously… you might want to try practicing the delivery of your script next time. Not all people have a natural gift for this type of thing, but you can easily learn how to create a “flowing” presentation. If you apply yourself I’m sure you will be able to deliver a speech that keeps the audience members spellbound from beginning to end in no time! Good luck in the future, buddy! Yep when I hear him or Marc Bean I always look for the “flush” button on my computer!!! 1)Attract cruise ships to Bermuda with special emphasis on locating appropriately sized ships for St. George and Hamilton – Even when you attact them – YOU NEED TO REMEMBER TO SIGN THE CONTRACTS – WE HAVE 12 LESS CRUISE SHIPS COMING THIS YEAR BECAUSE A MINISTER BNEVER SIGNED THE CONTRACT IN TIME! 2) We will expand air lift from Europe, the Caribbean, The Gulf Corporation Council Region, the Azores and Latin America creating opportunities to bring more tourists to our shores. – AND WHERE WILL YOU PUT THEM – ALMOST EVERY MAJOR HOTEL IS CLOSED! – WE CAN NOT AFFORD A SUBSTANTIAL INCREASE IN TRAFFIC WITHOUT BEDS – SO WHY SUCHA A LARGE PUSH – WHY WASTE MONEY – JUST TO TELL PEOPLE – WERE ALL BOOKED UP – SORRY! 3) We will acquire additional ferry lift to expand the service. DIDNT YOU SHRINK THE FERRY FLEET AND ROUTES BECAUSE OF LACK OF INTEREST AND BECAUSE IT WASNT COST EFFECTIVE. 4) We will work with the minibuses to provide shuttle services that enhance and compliment public transport. CAN WE NOT COUNT ON THE BUSES AND DRIVERS WE HAVE ALREADY – FIX THE BUSES! I’M SURE WAYNE IS HAPPY THOUGH! 6)We will work with the taxi commission to reform the system. JUST WHAT THEY WANT – DID YOU NOT LEARN FROM THE GPS – DISASTER! 7) Install cameras on buses to make them safer and implement a fully digital taxi dispatch system. ANALOG WORKS FINE – IF THE DRIVERS WANT TO MOVE. MOST WOULD RATHER WAIT FOR A FARE INSTEAD OF DRIVING 15 MINUTES FOR A $10 FARE. CAN’T BLAME THEM I WOULD TOO. 9)Redevelop the airport – WHY ??? THE AIRPORT WE HAVE EASILY HANDLES THE 200 PEOPLE WE GET HERE PER WEEK? I TRAVEL OFTEN AND I CAN’T SAY I REMEMBER LONG WAITS OR LINES IN THE LAST 5 YEARS? I WILL SAY THAT THE CUSTOMS OFFICERS ARE MUCH FRIENDLIER NOW – SO GOOD JOB THERE! You what the real scary part of it all? He believes himself. That’s scary because Roban is so far in La La land its not funny. Please don’t vote these dreamers back in. Grinch , I think our premier is in the same La La Land. Roban needs to have someone help him with his presentations,it is embarassing to hear him speak. @Webster: I agree, and the embarrassing thing is that these press releases are going over the internet. People already think we live in tin shacks. Now we have politician who can’t speak and read English in a proper way. OMG!! 5:18 – echo friendly buses? Ive always hated when I hear an echo on the old pink and blue. Glad they are finally sorting this out. Or did they mean eco….? So tired of Roban and his lies and distortions that now when he shows up on my TV screen, I instinctly reach for my remote! He really insults our intelligence by assuming we are not smart enough to do our own research and fact checks. Question to Minister Robain: Just how much “sure & steady progress” has been made on this critical & expensive matter in the past 22 Months? Like everything else – the answer is NONE. PLP’s solution, just keep doing the same thing (in this case giving in to the BIU) and borrow more to pay for it. Time to vote these jokers out! I’m sorry, what does that mean you can’t blame the government for poor usage of St George’s fast ferries? Must be talking about during the winter as in the cruise ship season the ferries are over subscribed and St. George’s businesses and Corporation cry out for more, more, more! Wow , we are about to witness history .. It’s not often one gets to see a brand new political party hit the polls . So while we are talking about transportation let me say that I’m excited about the OBA and its maiden voyage , every cabin has been filled and the food is plentiful . The band has been contracted and the engines are tuned up and ready to go . Winter is upon us soon and the icebergs have formed in the north . I’d like to say to all on board Bon Voyage and enjoy the trip . I don’t think the PLP are worrying that the right minded don’t believe their BS. Its their brain damaged loyal supporters that they have to keep convincing because their vote is guaranteed. I am so embarrassed that these “news” conferences are being seen by the world. Every one of these televised ridiculous events weakens our reputation as a premier destination to anyone watching it overseas. If this is how he conducts a press release, how does he conduct the business of his Ministry? Bermuda is in a sad, sad state. Please vote for change. ANY change will be an improvement! Grasping at straws…such a weak argument Roban. Transportation in Bermuda is a disgrace and why has already been eloquently pointed out above. Another catalogue of PLP failures. @ Roban you are more concerned with the OBA, PLP are very weak the question is what are you going to do? Nothing!!!! It was a real challenge but I managed to get into 2 minutes of his middle school level reading. Couldn’t bear to watch any longer. It was that painful. Imagine him with execs of the airlines or cruise industry! What must go through their minds?? This Rabain is a joke!!! I’m so tried of this PLP Goverment!! Get out once and for all! !